Welcome to the mexbound.com guide to driving to Ensenada. Thanks to our San Diego roots, we're able to provide you with firsthand, detailed information on driving directions and maps to Ensenada. Before you leave on your next adventure south of the border, be sure to purchase Mexican Insurance from mexbound.com. Remember, mexbound.com is "the first choice for the smart traveler." Ensenada known as the "Cinderella of the Pacific", located 70 miles south of the San Ysidro International Border. As you come to the top of the hill, move into the right lane. At the bottom of that hill the road will fork Left and Right, take the fork to the right. It is marked with arrows Rosarito/Ensenada/Ensenada Cuota. (Cuota stand for the Toll Road). There are three tollbooths in total. The first toll booth is just past the Tijuana Playas off ramp. Second is about 15 miles south just passing the last Rosarito Beach off-ramp. The third and end of the toll-road is at San Miguel. After you pass the last toll booth it's about six miles to Ensenada proper. About one mile before you get there you'll come to a fork in the road, stay to the "right" and this will take you in the front end of town. At the first signal, you will be on Boulevard Costero. The drive is about 1 1/2 hours once you cross the border. Take I-805 to Hwy 94 East. Follow Route #3 South toward Ensenada. The directions provided in this section are opinionated general guidelines for driving to Ensenada Baja California, Mexico. 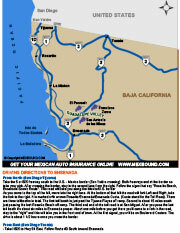 We offer these directions, to show possible driving routes to Ensenada. Highways and road conditions are constantly changing, be sure to consult a Mexico road map for official driving routes in Mexico.